There are a lot of Rangers fans who are absolutely going to love having defenseman Ryan McDonagh on their favorite NHL team in the years to come. Blueshirts fans are known for embracing steady, strong defensemen who can shut down the opposition, contribute to the offense, and rarely make mistakes in their own zone either with the puck or without it. 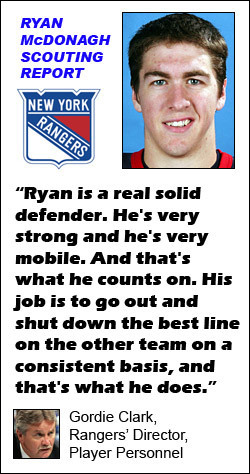 If this describes the ideal future Ranger blueliner, it also describes the 6-foot-1, 212-pound McDonagh. The University of Wisconsin standout, with a bright NHL future in front of him, turns 21 on Sunday -- just under a year after coming to the Rangers in the high-profile 2009 trade that sent Scott Gomez to Montreal. That Gomez deal has already delivered the opportunity to add free agent Marian Gaborik, who went on to score a career-high 42 goals and 86 points for the Rangers this past season. While the addition of Gaborik paid obvious and immediate dividends, the deal with Montreal included two components that could also bolster the Rangers defense for years to come. The Canadiens parted with a pair of highly-regarded prospects in 22-year-old Russian Pavel Valentenko and McDonagh, a prized 2007 first-round draft pick few Montreal fans had ever thought the team would surrender. McDonagh says he was surprised by the trade, but he quickly embraced the opportunity to be a Ranger. "It was the middle of the summer, and I was just going about my day," he recalled. "I picked up the phone, and it happened to be Bob Gainey, who said I had been traded to the Rangers. He thanked me for everything I had done thus far, and as soon as I hung up, I got a call from Glen Sather wishing me congratulations and letting me know that I was part of their team now. So it was exciting. You can look at getting traded in many ways, but obviously it means one team really wants you. That's how Glen Sather explained it to me from the Rangers' perspective, so I was pretty happy to hear that." 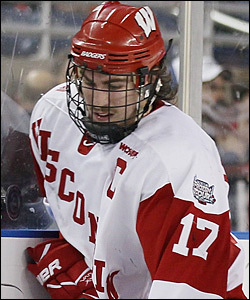 One of three Badgers captains during the team's highly successful 2009-10 campaign, defenseman Ryan McDonagh's steady defensive play helped take Wisconsin all the way to the NCAA title game. A junior at Wisconsin this past season, the 6-foot-1, 212-pound McDonagh is a two-time member of The Hockey News' Future Watch list of the Top 50 drafted prospects playing outside the NHL. He had a very strong year in 2009-10, notching career-highs in assists (14), points (18) and plus-minus rating (plus-23). The Tri-Captain helped lead Wisconsin all the way to the NCAA title game at Ford Field in Detroit. McDonagh is one of organization's four defensemen under the age of 24 who were first-round NHL draft picks. This impressive list also features Michael Del Zotto, Marc Staal and Dylan McIlrath. Each brings his own skills to the table, with McDonagh perhaps possessing the most “bite” to his game. McDonagh is a tireless worker, whose incredible fitness level made him a favorite of scouts ever since his draft year. Gordie Clark, the Rangers' Director, Player Personnel, was awed by McDonagh at the 2007 NHL Combine, where teams had an opportunity to interview players and test their physical fitness. "I remember back in that draft year, I would say he might have given the single most impressive performance I have ever seen during the testing at the Combine," said Clark. "It was like a man working out against boys. I think you can still see that in his play." At the 2007 NHL Entry Draft in Columbus, the Rangers were thrilled to land the late Alexei Cherepanov, a budding Russian superstar, at No. 17. They were very disappointed, however, to lose a shot at McDonagh five spots earlier, when the Habs stepped up and made him the fourth defenseman selected overall. McDonagh's draft position, No. 12, was the same one where Staal had been taken as the fourth overall defenseman two years earlier. At the time, he had no way of knowing that the Rangers had wanted him much the same way they had coveted Staal. "At the (2007) Combine, I had an interview with the Rangers," said McDonagh. "I remember that it was exciting meeting with Gordie Clark and their staff up there. I felt I had a good interview with them. So in that sense, maybe I had started a good relationship." McDonagh was a special NHL prospect even before he went in the first round. His high school career in Minnesota was legendary, as the St. Paul, Minn., native led Cretin-Derham High School to the 2006 Minnesota State Championship as a junior and was named Minnesota's Mr. Hockey as a senior. He scored more than 85 points in 51 games over those seasons and was a First Team All-State selection both years. More than just a hockey star, McDonagh was also an outstanding baseball player and spent two seasons on Cretin-Derham's varsity football team. Football was in his blood, since his uncle is former star quarterback Steve Walsh, who played for six NFL teams and won the 1987 NCAA championship at Miami. In addition to this tremendous athleticism, McDonagh is an excellent student who has been honored with spots on both the Big Ten All-Academic and WCHA All-Academic teams in each of the past two seasons. 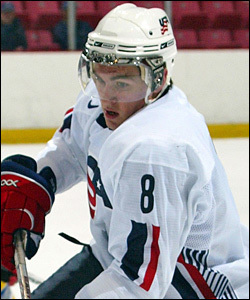 Although they couldn't get him in the draft, Rangers scouts kept an eye on McDonagh when he entered Wisconsin, went on to earn a spot on the 2007-08 WCHA All-Rookie Team, and starred for the U.S. 2009 World Junior Championship team. His three points over six games at the World Juniors included an assist on James Van Riemsdyk's overtime goal to beat Germany in the tournament's fifth-place game. Named Minnesota Mr. Hockey during his senior year at Cretin-Derham High School in St. Paul, Ryan McDongah went on to represent the U.S. during the 2009 World Junior Championship tournament. In 119 career games at Wisconsin, McDonagh has posted 14 goals and 32 assists for 46 points with a plus-28 rating. Offensive numbers hardly tell the story, however, since his game is more about on-ice leadership and overpowering opponents in his own zone. The team awards McDonagh collected at Wisconsin speak more to these qualities. He is a two time winner of the Badgers' Most Competitive Player award and also captured the Community Service Award last in 2009-10. "As a defenseman, I want to make sure I'm strong in my own end," said McDonagh. "A team won't be able to live with you for very long if you're not taking care of your own end and making smart plays and keeping the puck out of your own net at times. I'm a big guy, and I like to be physical and tough to play against for the other team's best forwards. I like to match up against them a lot and log a lot of minutes." On the ice, McDonagh contributed some big points as the Badgers won 28 of 43 games before falling to Boston College in the Frozen Four finale. The most dramatic of his four goals came on a power play at 11:37 of the third period against Merrimack, giving Wisconsin a 5-4 victory on Jan. 2. "I like to play on the penalty kill and power play, and when the time is right to create some offense as well," McDonagh said. "I'm trying to develop more of that, so hopefully I can be a dual threat, but I want to be strong defensively, for sure, and not give up goals against when I'm out there." With the Badgers, McDonagh was a teammate of fellow Rangers prospect Derek Stepan, who entered the school one year after McDonagh, his friend from long before college. Stepan, a fellow Minnesota native, was Wisconsin's leading scorer in 2009-10 and captain of the 2010 U.S. World Junior Championship team. When McDonagh was traded to the Rangers, nobody was happier than Stepan. "He (Stepan) was at the Rangers' prospect camp when the trade happened last summer, so he was pretty excited," said McDonagh. "He called me as soon as his day was done at the camp. He said that one of the coaches had pulled him aside in the middle of the practice to tell him that the Rangers had just traded for me. He was all excited. It was pretty cool." Having a fellow Rangers prospect on the Badgers helped keep McDonagh focused on his hockey future. "Obviously, when we were back in Madison, we would talk with excitement about playing together again one day at the next level," he said. McDonagh and Stepan will be reunited later this month, when the Rangers Prospect Development Camp takes place at the MSG Training Center. They will also see another familiar face in Chris Kreider, who was Stepan's teammate at the World Juniors and part of the Boston College team that beat the Badgers for the NCAA championship. Ever the competitor, McDonagh still feels the frustration of that NCAA defeat. "On the big stage, when it mattered most, we just couldn't find a way to get our game going," he said. "Give credit to BC. They were a good-skating team and pretty fast. They used their strengths well, and we couldn't get ours going. But it was great to finally get on that big stage at the college ranks and see what it's like to be at the 'top of the mountain, as we like to say, trying to win a championship for your school. "To go that far and not really seal the deal stings a lot. I think it's only going to help the guys that are coming back next year and the ones that are leaving to play in the pro ranks in terms of motivating them that much more." Many Wisconsin players have gone on to enjoy both immediate and long-term success in the NHL, including former Rangers stars Mike Richter and Tony Granato, as well as future Hall of Fame defenseman Chris Chelios. Clark says McDonagh could be yet another member of this Badger group in making a strong transition because of his physical tools and his style of play. "He's a guy that can play the same role he played in college," said Clark. "The shutdown role he played in college is something where he can go right into the NHL like that." McDonagh recognizes the challenge ahead of him, but he's also very confident that he can handle it. "Obviously, I'll find out more when I get there (the NHL)," said McDonagh. "But I have talked with a lot of players that have played at Wisconsin and played at other colleges and have made the jump. "They say the game is a little bit faster and guys are bigger and stronger, but because I'm at a pretty good size right now and have some good strength, I sense that aspect might not be as tough of a jump for me. I have played at the World Junior level and in international tournaments as well. Those games are played at a lot faster pace, and I think that experience will help me."